The 5-acre site that was previously home to 120 functionally obsolescent apartments was zoned for multifamily in the middle of a single-family residential community. In 2016, the property was rezoned for single-family residential development and prototype home designed were completed. The southwest side of Lake Parker will transform from a simple 5ft concrete sidewalk to a 10ft shared-use asphalt path between Bon Air St. and East Bella Vista St. This 1-mile stretch will connect General Van Fleet State Trail with the Fort Frasier Trail. Student-led historical artwork will be incorporated along the bands as well as decade themed portraits. Formerly a 1920s A&P Grocery Store, the space is completely renovated with wall-to-wall white brick, twenty-two-foot-high ceilings, amber stained and sealed cement floors, oversized warehouse windows with black industrial finishes. Holding up to 500 guests, Haus 820 is the newest, premiere event venue in Central Florida offering the perfect balance of vintage and modern. Book your event here. The Federal Building is Georgian-Revival style building constructed in 1917. Located in the central business district and steps away from Munn Park, the space includes over 15,000sf at the ground and basement levels. Once a post office, the building is now home to MOJO Federal Swine & Spirits and Federal Bar Lakeland, further strengthening the push to turn downtown Lakeland into the place to be for area nightlife. Crystal's World of Dance is a community based organization that strives for excellence in artistic expressions by bringing the arts to the forefront of community experiences. 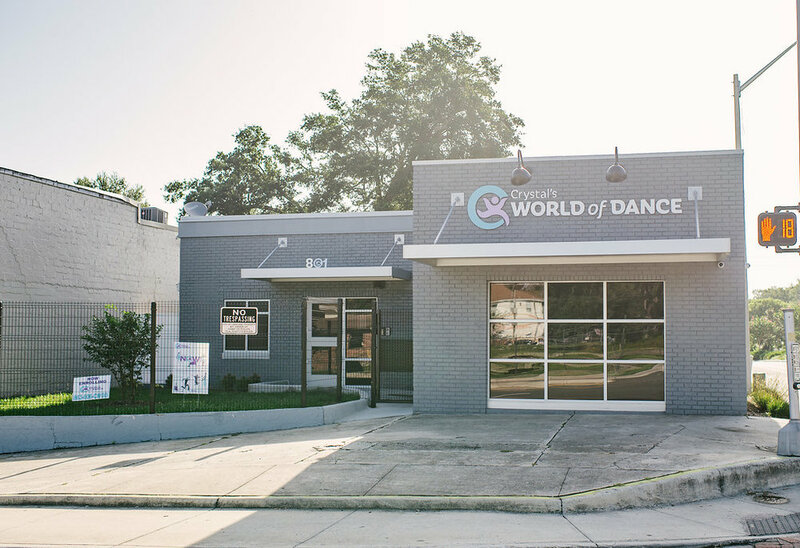 They offer an outlet for the art of dance in a positive atmosphere while providing nurturing experiences that enlighten paths and empower futures. Dancers have the opportunity to develop self-esteem and positive self-encouragement through the art of dance. A collaborative sixteen slot art studio and gallery for regional artists with the objective of building a vibrant community by offering contemporary art and cultivating local artists. DOU Bakehouse is a wholesale bakery that specializes in handcrafted, quality baked goods ranging from cookies, cupcakes, muffins, and cakes. They service hotels, restaurants as well as amusement parks and resorts across Central Florida. Follow them on Facebook or Instagram! A collection of twelve 2-bedroom, 1-bathroom apartments oriented around a shared courtyard with limited access gates. The Lofts are within walking distance of Downtown Lakeland. Once a former Publix, now restored and used as the Polk County Tax Collector’s Regional Service Center for Western Polk County, 916 N. Massachusetts Avenue is a 25,000 SF Art Deco structure on a 2.48-acre site. The CRA’s provision of gap funding for $600,000 of a $4,600,000 project facilitated the feasibility of the project which now brings in 1,200 customers per day to the area, restored a historically significant building, and provided jobs in an economically depressed area. A branch of Gospel Inc. formed in 2013, offers a nurturing space for women in transition out of homelessness and teaches artistic skills that are transferrable and income generating. The East Main District is on the fringe of the downtown core with all the urban amenities. The district is affordable, flexible, unique and ripe for infill development. Because of the desire to turn East Main District into a one-stop destination for artists, creatives, home décor and innovative entrepreneurs, incentives for the area are generous. NoBay Apartments is the first new development project in Downtown Lakeland in over a decade and the first new residential development of major scale in 20 years. The property, previously a public parking lot, covers 75% of a city block and is comprised of 55 bedroom apartments, 10,000 SF of commercial/retail space and interior tenant surface parking. The 55 new residences increased the market rental units available Downtown by over 60%. The City of Lakeland has a bold vision for our Downtown! See for yourself scrolling through the story map below. We are working alongside the Florida Department of Transportation (FDOT), Lakeland transportation planners and engineers, to envision a complete, safe, and walkable Dixieland corridor from Lime Street to Ariana Street.